It is better for him to pray in al-Rawdah which is the area between the minbar of the Prophet (peace and blessings of Allaah be upon him) and the room in which is his grave, because this area is one of the gardens (riyaadh, sing. rawdah) of Paradise. There are only three special mosques on this Earth. Period. I heard Abu Saeed saying four words. He said, “I heard the Prophet (saying the following narrative).” He (Abu Saeed) had participated in twelve holy battles with the Prophet. Making special visits to other mosques is not allowed. This doesn’t mean we can’t visit any other mosques. But setting out on a journey only to visit a mosque (other than these 3) is wrong. Travelling to another country/city just to pay a visit to a mosque = wrong. Travelling to another city/country for work/leisure, and visiting mosques = right. Intention is different, you see. Intention matters. The best of all mosques is al-Masjid al-Haraam (The Sacred Mosque in Makkah), then al-Masjid al-Nabawi (the Prophet’s Mosque in Madeenah), then al-Masjid al-Aqsa. Prayer in Masjid al-Haram: reward multiplied by 100,000. 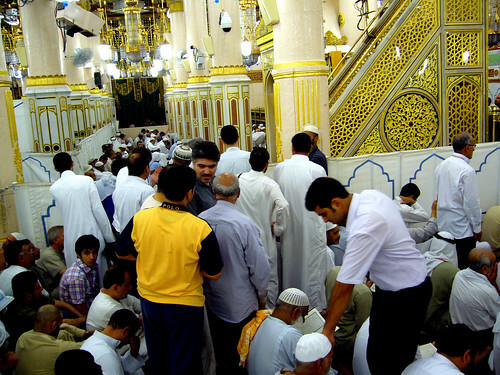 Prayer in Masjid an-Nabwi: reward multiplied by 1,000. Prayer in Masjid al-Aqsa: reward multiplied by 250. One prayer in my mosque is better than one thousand prayers elsewhere, except al-Masjid al-Haraam, and one prayer in al-Masjid al-Haraam is better than one hundred thousand prayers elsewhere. This hadeeth was classed as saheeh by al-Mundhiri and al-Busayri. Al-Albaani said: Its isnaad is saheeh according to the conditions of the two Shaykhs [al-Bukhaari and Muslim]. End quote from Irwa’ al-Ghaleel (4/146). One prayer in al-Masjid al-Aqsa is equivalent to two hundred and fifty prayers offered elsewhere. One prayer in my mosque is better than four prayers offered there (in Bayt al-Maqdis), and what a good place of prayer it is. Soon there will come a time when, if a man has a piece of land the size of a horse’s rope from which he can see Bayt al-Maqdis, that will be better for him than the whole world. Narrated by al-Haakim, 4/509; he classed it as saheeh and al-Dhahabi and al-Albaani agreed with him, as it says in al-Silsilah al-Saheehah, at the end of the discussion on hadeeth no. 2902. One prayer offered in the Prophet’s Mosque is equivalent to one thousand prayers (offered elsewhere), so one prayer offered in al-Masjid al-Aqsa is equivalent to two hundred and fifty prayers. One may pray at home if the weather conditions are severe (for men). When someone invites you over for a purpose, stick to that purpose. NEVER judge someone and/or his Imaan. You don’t know what’s in their heart. Whoever says la ilaha illa-llah and seeks Allah’s pleasure, Allah will admit him into Paradise inshaAllah. Prophet (SAW)’s words, not mine. Pray at your homes some of your prayers. Don’t let them become graves. Graves symbolize death. Meaning, your house is dead unless Allah is remembered in it. Bring it to life with Allah’s name!